Crashed Ice is Crazed Ice! Cameron Naasz skates at Red Bull Crashed Ice Athlete Search Finals at Loon Mountain, New Hampshire, USA on 12 January, 2019. By David Schissler – I recently had a first-hand look at what I believe is the newest winter sport. It’s called Ice Cross Downhill. Picture yourself on skates in full hockey gear, on a bobsled run, with three other competitors determined to bump and pass you. It’s like roller derby on skates, on a downhill track. 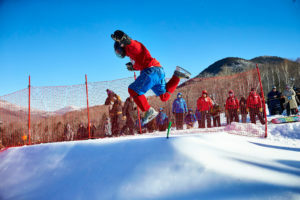 When I first heard about Red Bull’s Crashed Ice tour at the Boston Ski & Snowboard Show last November I knew I had to see it for myself at the regional qualifying event at Loon Mountain. I learned there’s an entire international tour sponsored by Red Bull with stops in Buffalo, Boston, Yokahama Japan and Jyvaskyla, Finland. This year, the World Championship is February 8-9 in Boston inside Fenway Park! 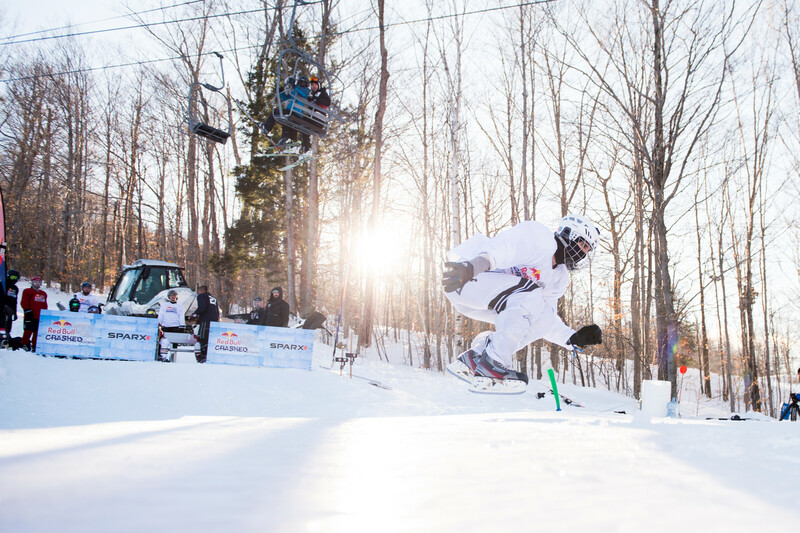 After a series of flat-ice qualifiers the top 24 men and 24 women from eight states and Canada, came to Loon Mountain to experience the complexities, thrills and spills of a downhill track. The crew at Red Bull, under the direction of Tournament Director Scott Crowder, constructed the course. 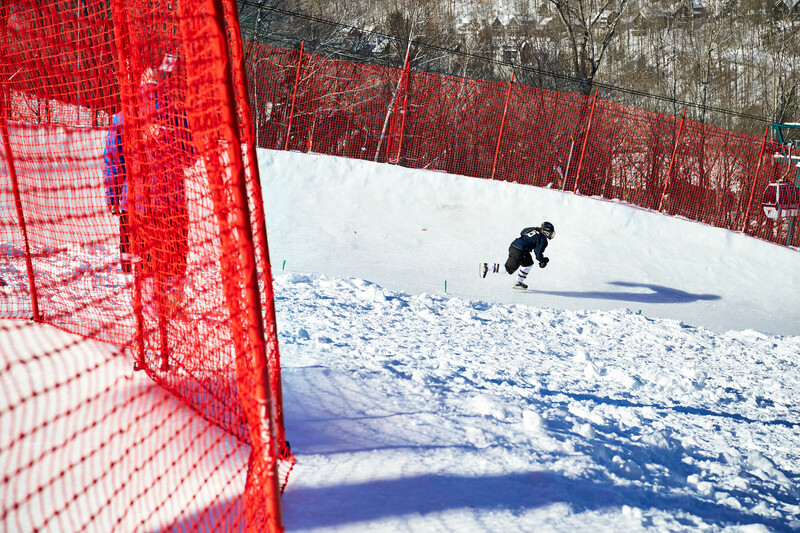 The 600-foot long, approximately 150-foot vertical downhill track was quite literally a sheet of ice as intended. Right out of the start competitors had to deal with a four-foot jump into a hairpin turn which funneled them into a straight away toward a huge right-hand banked curve. They carried their speed and momentum out of that curve into the finish. Each athlete was given two practice runs before the heats that would determine the two winners of a spot in the Boston event. It was a bright and shiny Saturday at Loon Mountain but single digit temps and a north wind made it bitter cold. So cold, when two-time Red Bull Crashed Ice World Champion Cam Naasz poured water on a spot or two on the course to ensure the ice quality met his standards, it froze solid in minutes. The 48 men and women took it in stride as did many of their family and friends. The practice heats did their job, which was to separate the “skaters” from the “racers”. It was easy to see the difference in aggression and confidence. New Hampshire local, Thomas Missert captured the men’s top spot and punched his ticket to Boston. “I feel electric, I’m ready to go! Since the qualifier, I have prepared for this moment skating on Lake Winnipesaukee and working out five days a week. I can’t wait to compete in Fenway – this is a dream come true,” he said. 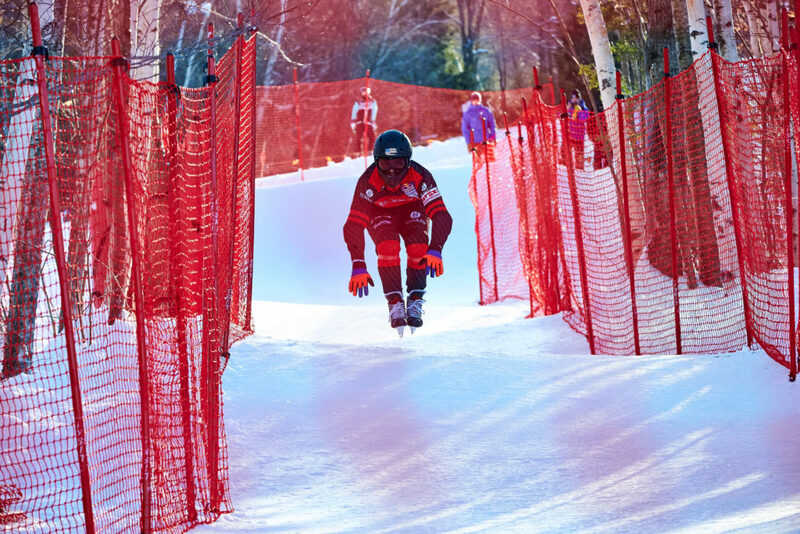 Ice Cross Downhill is making its stadium debut this February at historic Fenway Park. After seeing the qualifier in person I have a first-hand appreciation of the athleticism and toughness of the top echelon competitors. 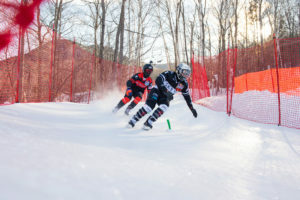 Racing down a curved, banked course in a stadium, four at a time, shoulder-to-shoulder and reaching speeds of 50 mph on skates is as thrilling and entertaining as any boarder or skier cross event. For more information on Red Bull Crashed Ice and to purchase tickets, please visit redbullcrashedice.com.